I love reading fairy tales, but I don't often think seriously about the curses and darkness in them. Evil is *evil,* no matter its flavor... (right? no, it’s not quite that simple). However, once in a long while I'll come across an exceptional story that makes me reconsider and truly examine darkness or an antagonist from all sides (and I'm not just talking about making them relatable). In those moments I know I've fallen in love with a book, and I think I understand and believe a bit more in magic. 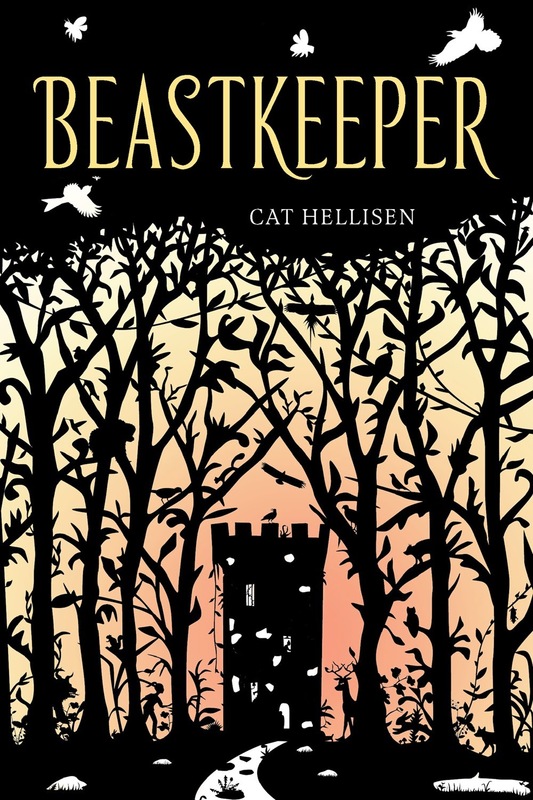 Cat Hellisen's Beastkeeper is one of those captivating, intense books, and I can't get over how much I adored it. A haunting story of magic, curses, and dangerous family secrets. Sarah has always been on the move. She's grown up lonely, longing for magic. She doesn't know that it's magic her parents are running from. When Sarah's mother walks out on their family, all the strange old magic they have tried to hide from comes rising into their mundane world. Her father begins to change into something wild and beastly, but before his transformation is complete, he takes Sarah to live with grandparents she's never met. Deep in the forest, in a crumbling ruin of a castle, Sarah begins to untangle the layers of curses affecting her family, until she discovers that the curse has carried over to her, too. The day she falls in love for the first time, Sarah will transform into a beast... unless she can figure out a way to break the curse forever. Sarah lives a transient life – her parents regularly move house and uproot her from everything familiar. Still, she’s been secure in her parents’ love. Then one day, a curse comes home to roost. Of course, Sarah doesn’t believe in curses (who does, in this day and age?). But really, the proof is undeniable. And though Sarah is young, she’s stubbornly determined to fix things and to be less alone. In her quest, she’ll unravel family history and grow up herself. Sarah’s story is a fairy tale of sorts, sure, but it’s also about secrets, and the little hidden places in the natural world and within us that make magic seem possible. It’s about the terrible and mundane reality of a family falling apart. And it’s about the fabric that stories are woven from, about unreliable narrators, and curiosity. Like most fairy tales, the story has a brutal side. I don’t mean brutal in the sense of “too much for young readers,” just in a “real life is actually 100% awful sometimes” sort of way. Sarah’s journey is difficult, necessary, and engrossing. Love and loving are strange things, and they don't care for how old or young you are. Curses are made of terrible desires, twisted and turned into things that humans should not feel. The story has layers of motivation, ferocious emotion, and an ending that recalls my favorite childhood fantasies – open-ended and complex. Hellisen fashions something new out of an old (familiar) tale with plot, yes, but also with exquisite language. If you’ve been hungering for a book that reads like art, Beastkeeper is it. The words bring Sarah's world to life: jewel-bright, trembling, warm and cold, everything just as jagged and *feeling* as childhood. The absolute accuracy in which Hellisen describes Sarah’s first taste of despair, or determination, is devastating. I felt the awkwardness, urgency and empathy of my own preteen self rushing back in memory as I read. In all, Beastkeeper is a magical, dark and terrible sort of enchantment – the kind that changes all it touches. I found it absolutely captivating. Recommended for: readers over the age of ten who love fantasy, and anyone who enjoyed Erin Bow's Plain Kate or Ellen Potter’s The Humming Room. This one has been on my radar for a while but then I didn't hear much about in the way of review so thanks for this one! It definitely sounds like something I should check out! Awesome! I love good fairy tale adaptations, and I SO love book covers with beautiful stencil patterns. I loved this one too, and how terrible the curses were. Good for you. Blogging is fun-like you it has introduced me to communities I never knew existed.